The Raider Belt is ongoing project to develop a lightweight belt system and blends the lines between a traditional duty belt and a modern battle belt. It's very rigid and only 2" wide, like most duty belts, so the user can mount standard belt accessories (holsters, mag carriers etc). It also features a reinforced slotted liner that allows the attachment of PALS mounted pouches. The liner is made of hypalon and covered in mil-spec Velcro loop. The user can index their pouches using these slots without fear of pouches shifting around. The Raider Belt can be used in conjunction with an inner, hook covered, pants belt or the user can add our belt pads to turn it into a stand-alone battle belt. The belt pads are two different lengths (6" and 10") and can be added anywhere padding might be required. Even with three large pads (pictured), the belt is only 3" tall and just over 1/2" thick, making it a very low profile setup. 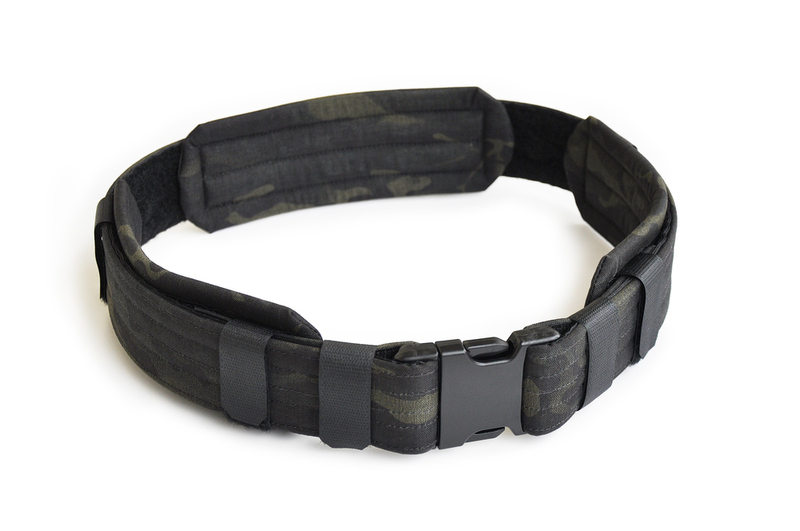 Below is a Raider Belt with pads in MultiCam Black, size small. The Pads are 8.5", which was a comfortable medium between the previous 10" and 6" pads, and will likely be the standard. Also note the addition of stand alone Velcro keepers at the front of the belt. These can be used if the user does not run the pads close to the front of the belt, or removes the pads completely. The second picture shows the PALS compatible indexing system with a short Malice Clip attached. These slots will prevent any attached pouches from sliding around on the belt. This belt weighs a total of 290g (10.23oz), making it very light when compared to other systems.